How Polypropylene bags are made? Welcome to Discount Polypropylene bags, your online resource for discounted polyprop bags. Whether you are complete beginner or expert on Polypropylene bags. We hope that our genuine information will help you to understand everything you need to know about PolyPropylene Bags. Also, do not forget to Visit our Buying Tips to help you Save the Money right away! Polypropylene poly bags are made from virgin polypropylene plastic. 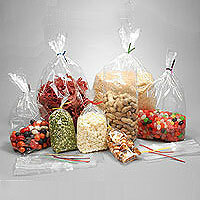 Polypropylene bags are versatile, attractive bags most commonly used for packaging small items such as beads and lollies. These bags can be sealed with a heat sealer like many other plastic bags. While polypropylene is similar to cello, polypropylene bags are much clearer with neater seals, and have the advantage of being less expensive than cello bags. Polypropylene poly bags have been the choice for product presentation and preserving freshness. Polypropylene poly bags are a high clarity crystal clear bag which enhances the product's image. They provide a highly protective barrier against moisture, dirt and vapors and meet FDA and EFSA specifications for food content. Polypropylene bags also referred as 'Polyprop bags' or 'PP bags'. These bags are by far the most popular for give away because of both its price and features. They are mainly used for displays. Professor Giulio Natta produced the first polypropylene resin in Spain in 1954. Natta utilised catalysts developed for the polyethylene industry and applied the technology to propylene gas. Commercial production began in 1957 and polypropylene usage has displayed strong growth from this date. The versatility of the polymer (the ability to adapt to a wide range of fabrication methods and applications) has sustained growth rates enabling PP to challenge the market share of a host of alternative materials in plethora of applications. Polypropylene is one of those most versatile polymers available with applications, both as a plastic and as a fibre, in virtually all of the plastics end-use markets. (Semi-rigid, translucent, good chemical resistance, tough, good fatigue resistance, integral hinge property, good heat resistance). Polypropylene bags are made using polypropylene (fossil fuel based plastic, bi products in the pertrolium industry) by extrusion process. There are two types of Polypropylene bags available in market and both manufactured by different method of extrusion. CPP or cast polypropylene film is a multilayer polypropylene film with co-polymer and homo-polymer. It is used as a heat seal layer along with BOPP or polyester film in a laminate for packing of food articles. CPP films have been known in the packaging field to be the more elegant brother of polyethylene film, with higher gloss, greater transparency and better heat resistance. CPP films have higher gloss and transparency, higher strength, superior barrier properties and excellent sealing strength. They are available with a polished or embossed surface, gloss or matte finish, stiff or flexible, clear or colored, or in a combination thereof. They are versatile and the most cost effective films. Holographic OPP films can be used exactly the same way as plain varnishing film. But in addition to the protection benefit, holography brings its own refractive and kinetic effects to enhance the visual appeal. As a cost-effective material, holographic OPP can also be used to laminate to cardboard. It can also replace plain OPP film to make flexible packages to boost the shelf appearance of products. OPP films are very versatile, can be adapted for diverse uses and are suitable for many types of packaging machines. These films are lightweight, bringing extra advantage in terms of packaging and are environmentally stable. They offer superior printability, machinability, and graphic appeal and provide cost savings over other flexible packaging materials. They are moisture resistant and durable. Oriented polypropylene film can be laminated to other materials such as paper, aluminum or other polymeric films. Laminations can be made using solvent-based or water-based materials. Printing technologies like gravure, flexo, offset UV, letterset UV and digital processes can be utilized to print OPP films. Compare prices in the industry & Save. For an example Polybags Limited, UK offers the lowest price on stock and custom polypropylene bags. They're committed to offering you low prices, so they'd love to know if you found a better price for any bags at another retailer. Calculate total cost of polypropylene bags including delivery coz some retailer may sell cheap bags but charge an extra on delivery. You can tell the difference between CPP bag and a BOPP Cellophane bag. You can not push your finger through a true BOPP bag. It is strong and stiff. A Cast PolyPropylene CPP bag will elongate when you push your finger through it. This tensile property, elongation, will allow CPP to elongate from 550% to1,000% of the film thickness. You can heat seal a BOPP Bag with and iron and it will not melt as easily as a CPP bag. The film is annealed in the manufacturing process which gives the film high temperature stability. Try this with your Cello Bag only if it is a Cello Bag, remember CPP bags will melt on you iron very easily . If you looking for a quality greeting card bags or display bags at cheap prices then please visit Greetings Card Bags for all your presentation & display bag needs. High Clarity Greeting Card Bags would make your product stand out!